Can a place still hold its inherent importance in a life– its spirit and meaning, when the people who are inextricably tied to it are gone? I have been turning this question over in my head and exploring the answer in my writing for some time now. Loss, and longing for Place: these have been themes for me that seem to reoccur almost unconsciously in my own work. This summer I was able to step outside the “boundaries” of the written page to explore the question for myself when I finally travelled back to my mother’s home country, Greece, after too many years away. The last summer we were able to visit, eight years ago, my son and daughter were 5 and 2, respectively. That summer was also the last one that saw my grandmother alive and well, although “well” is not the right word, as the tumor in her brain that claimed her life one year later was already working its damage. My grandfather had passed away two years before, only a matter of weeks after my daughter was born. With both my grandparents gone, there was no one left to lift their arms in greeting to us when our family of four tumbled out of the taxicab in front of their apartment building this past July. Yet I still craned my head to look towards the side balcony, where my grandmother had stood eight years ago in her soft housedress and waved to us when we first arrived. In the years since their deaths, I haven’t been able to shake the sense that a gigantic door in the universe somewhere had slid closed; that behind the door my artist grandfather still sits painting and there, in her kitchen, is my grandmother, making jam from the sour plums that hung heavy on the tree by the front veranda. In these intervening years, I couldn’t imagine Greece without my grandparents in it. If they were gone, surely the place was gone, too? How could one exist without the other? When I was a newish mother, I remember leaving my son for the first extended length of time when he was about ten months old. He seemed impervious to my departure, yet when I came back home a few hours later, and took him from his grandmother, he burst into violent tears. Why had my return saddened him to that extent? Later, when talking to an older and wiser friend, she told me what she had learned years ago and what I hadn’t known until then: that very small children separated for periods of time from their mothers (and fathers, too) often cry upon their return because it is only then, upon being returned to the familiar landscape of their bodies, that they realize just how much they missed them. Perhaps his tears were a response to the knowledge that he had existed, for a time, in a space without the person most connected to it. The child misses his mother, without even knowing it. Place, existing separate from the attachment to the people most important to it, can be frightening. Place is rooted deeply inside of us – it is like the ultimate time capsule. Its value lies not in just the geographical parameters that we can identify, but in the sounds, smells, and feelings that arise when we think about a particular location. A smell can shake us from the present and send us spinning back in time. A sound can make us pause and close our eyes, as we struggle to bring to mind some other place, some other time. Yet I always thought place had value the most because of the people who were tied to it. Like an empty house on moving day, place without the people who make it alive for us would seem hollow. What would have happened if the box had ceased to exist? What if it had been discarded, or destroyed? How can you miss something you forgot existed? Would I ever have remembered any of the things inside of the box, or the people attached to them, if the box had vanished? It’s actually a terrifying thought — to miss something, or someone, only because a sudden reappearance triggers the memory of their existence in the first place. No matter how hard we might try and tell ourselves that things don’t matter, that we need to unmoor ourselves from attachment to place and possessions, the truth is that they do matter, in real and compelling ways. As a child and young adult, I had been to the museum so many times that I can’t count them all. I know I always rushed through most of the rooms until I came to the one that housed this statue. There, I would stare and stare at the horse and boy, and imagine what it must have been like to be the fishermen who found them in fragments at the bottom of the sea. When I was in college, I had a postcard of this statue taped to the wall of my dorm room. 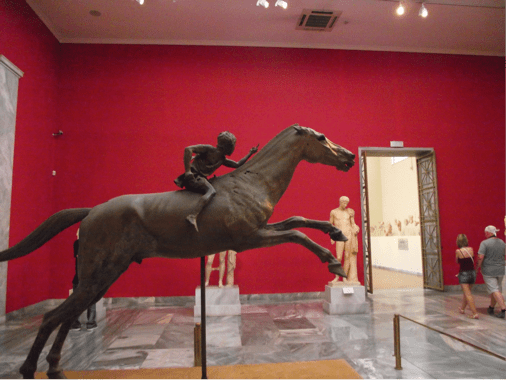 Yet, in the eight-year gap between visits to Greece, I had not thought about this statue once; in fact, I had forgotten about it entirely until I entered the room. Away from Greece for so many years, the jockey and his horse had simply ceased to exist for me. I am not sure why that fact seemed so terrible to me as I stood looking at the horse and boy that afternoon. I think there, in front of that beloved statue, the enormity of what it had meant to be away from Greece – from my second home country, from a place that is so inextricably tied to who I am – hit me full force, and along with it, all the other losses attached to it. I was a child again, crying at the return of something precious.